Every so often, I receive an email message from a friend, family member or coworker with various weather photos attached. The photos are always neat to see and I am happy that these folks think of me when they see weather-related photos. Please, keep them coming! I will periodically post one photo from these emails and talk about it, as there are plenty of photoshopped weather photos on the net. There are also a surprising number of real photos with false explanations. Finally, some of these photos are uncredited, and so I will attempt to find the original creator and link it here. THESE PHOTOS ARE NOT MINE, PLEASE DO NOT CREDIT ME FOR THEM!! Too many times storm chasers and photographers will work exceptionally hard to take the right photo, just to have someone else take the credit. I will attempt to find the original creator, and if you have more information (or it is you!) please let me know. 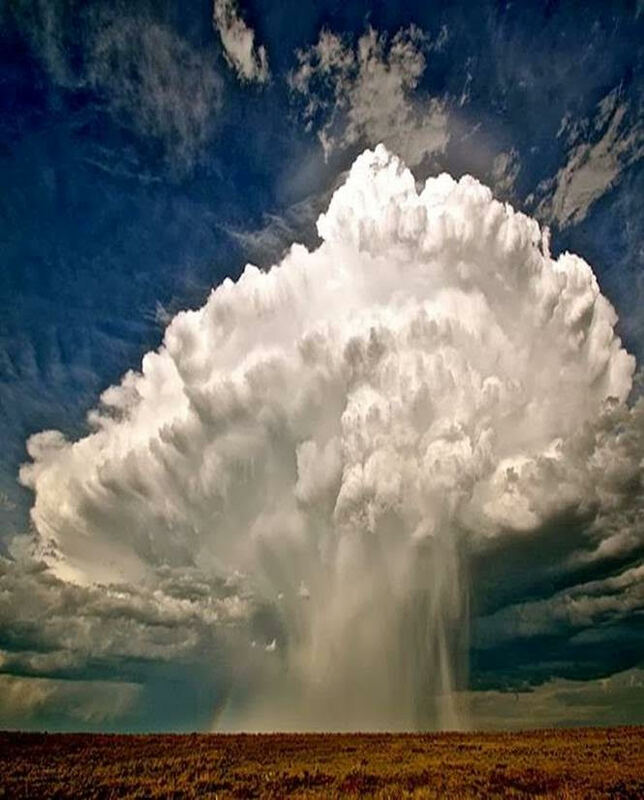 This photo is likely real, as I have witnessed this type of downburst myself many, many times. This one was particularly photogenic. Well, not quite. Actually, in your garden-variety thunderstorm (such as this) the precipitation means that the storm has moved onto the mature state. At the very start of precipitation, its updraft and downdraft begin to fight for real estate near the storm. As the precipitation falls, it will cool the air, and eventually cut off the warm, moist inflow required to sustain the storm. In this case, I bet there is limited shear, based on the limited anvil movement downwind, and this storm is on its way to choking itself off. However, a new storm could form on the boundary that this storm creates with its dying gasps. This photo shows up in several Flickr and Pinterest galleries, according to Tin Eye, but I haven’t seen any legitimate credit for this photo. Real, though slightly inaccurate and uncredited. Enjoy the photo! Don’t worry though, I will have some fake ones and inaccurate ones soon! This entry was posted in Commentary, Photography and tagged copyright, email, meteorology, photography, storm, weather. Bookmark the permalink.